Get kissable lips with EOS Strawberry Sorbet Lip Balm. This lip balm with vitamin E is 95% organic and made from 100 percent all-natural ingredients. EOS Strawberry Sorbet Lip Balm is enriched with ingredients like nourishing Shea butter, antioxidant-dense Vitamin E and essential Jojoba oil. The ingredients in this organic lip balm work together to help your lips look and feel moist, smooth, and soft. Free from petroleum and parabens, this organic lip balm does not leave a gooey or sticky residue. The moisture penetrates deep into your lips for essential moisture that lips need. 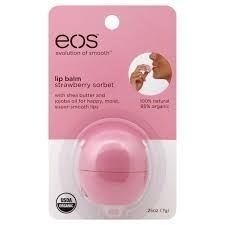 EOS Strawberry Sorbet Lip Balm comes in an easy-to-use pink 0.25 oz applicator.